Instead of fresh fruit, try fruit juice, apple sauce, or canned peaches and pears. Instead of raw vegetables, try vegetable juices or mashed and cooked vegetables. Instead of large pieces of meat, try ground meat, eggs, milk, cheese, yogurt and other dairy products. Instead of drinking milk, try dairy foods that may not upset the stomach, like cream soups, pudding, yogurt, or cheese. Replace vegetables such as cabbage or broccoli with vegetable juices or carrots and potatoes that are easier to digest. Replace fresh fruit with fruit juice or soft canned fruits. Requesting a local store deliver groceries to the home. Requesting volunteer shopping help from a local church, synagogue or volunteer center. Asking a family member or neighbor to help with shopping. Enlisting the help of a local home care agency, such as Hired Hands Homecare. Can’t cook: Problems with cooking can include difficulty holding cooking utensils, pots and pans or trouble standing for long periods of time. Use a microwave oven to cook TV dinners, other frozen foods and foods made ahead of time by the store. Hire a home care agency. As part of Hired Hands Homecare’s in-home care services, we can plan, shop for, and prepare healthy and delicious meals that meet your loved one’s unique needs and likes. Eating with family and friends. Joining group meal programs offered through local senior citizen’s programs. Talking to a doctor about whether or not medication might be a problem. 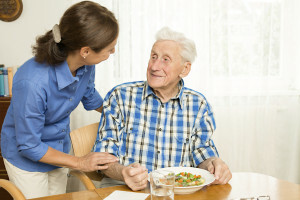 Contacting a local home care agency, such as Hired Hands Homecare, to have a companion prepare and participate in making meal time a social activity. Due to illness, medication interactions, depression, and other age-related issues, malnutrition has become an all too common problem for seniors today. Hired Hands Homecare can help! Contact us to learn more about our meal planning and preparation services today!